The purpose of this page is to assist you in planning a Funeral Mass at The Parish of Christ The King. 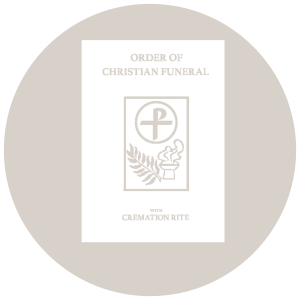 The Order of Christian Funerals is composed of three movements: A Vigil Prayer Service at the (Funeral) Home or church, a funeral Mass at church and a Committal at the final resting place. This order book concentrates on the Funeral Mass itself. The other two moments of prayer can be planned by the priest or presiding minister in consultation with the family of the deceased. There are five parts to the liturgy at the Church. You have the possibility – in fact, you are encouraged – to help plan the Funeral Mass. You have options concerning the entrance procession, the readings, songs, etc. These are explained in this book. Please take a few moments to read these pages and then discuss with the member of the parish consolation team who has been or will be in contact with you. We will now review each of the five parts of the Funeral Rite and list the various choices you can make to help shape this liturgy to best reflect the faith of the deceased and the hope of the family and friends who pray for eternal rest and peace for the deceased. Family members or friends can assist in placing the pall on the casket after the priest has sprinkled it with holy water, a sign of the baptism of the deceased. A member of the family may place a symbol of Christian life, e.g., a cross, a bible, the Book of Gospels, on top of the pall at this point. The Church offers us the opportunity to hear three readings from Sacred Scripture. One reading is customarily from the Hebrew Scriptures (the Old Testament), one reading from the New Testament (the Epistles) and a Gospel selection. In the appendix of the book, we have printed the selection for Funerals for Adults. If the circumstances of the Funeral you are planning suggest different scripture readings, please feel free to discuss this with the office. It is appropriate to have members of the family or friends read from Sacred Scripture. It is preferable to have a different reader for each of the first two readings. The priest or deacon will select and proclaim the Gospel. The homily follows the readings and is given by the priest or deacon. If you have any particular suggestions to offer in this regard, please share them with the office. The homily focuses on God’s compassionate love and on the Easter mystery of death leading to resurrection. While it is personalized for the deceased, a family member or friend may offer some brief remarks of a more personal nature toward the end of the Funeral Mass. After the homily, we have the General Intercessions or Prayer of the Faithful. You may suggest specific intentions. Two family members are invited to bring the gifts of bread and wine to the priest. The usual order of Mass is followed. After the Eucharistic Prayer, we recite the Lord’s Prayer, we exchange a sign of peace and are offered Communion. 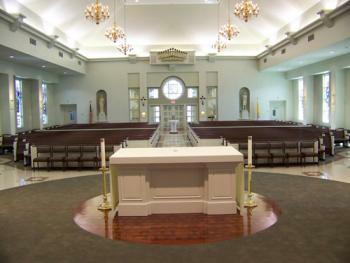 Any Catholic in good standing with the Church is invited to receive Communion by coming up the center aisle. Sometimes a family member may wish to say a few words about the deceased before the Final Commendation. By no means is this required. A dignified, brief memorial to the deceased could be offered. It is also possible to have a family member or friend say something at the Vigil Service in the Funeral Home or at a collation. Please review the last page of this book in regards to the words of remembrance at the funeral. After a brief invitation to prayer, there is a period of silence, the body is incensed and a prayer of commendation is offered. The priest and assisting ministers precede the casket; the family and friends follow. The pall and any Christian symbol are removed by the Funeral Director at the door. 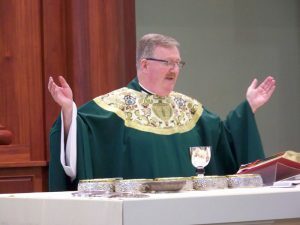 The parish’s Director of Music Ministries and the Resurrection choir will assist the congregation in singing an Entrance Song, a Responsorial Psalm, a Gospel Acclamation, an Offertory Song, the customary Acclamations, Lamb of God, a Communion Song and a Recessional. If you have a particular song you wish sung, and it is appropriate for Church, please consult a consolation committee member or the Office. NOTE: If desired, other familiar hymns may be requested, but will be performed at the discretion of the Music Director and the Soloist. Secular music is not appropriate for funeral masses. Out of great reverence for the body, the Church urges that it be present in church for the Funeral Mass. Therefore, it is recommended that cremation follow the funeral. If, however, cremation precedes the Mass, it is permitted that the cremated remains of the deceased be present in church during the Funeral Mass. The souls of the just are in the hand of God, and no torment shall touch them. They seemed, in the view of the foolish, to be dead; and their passing away was thought an affliction and their going forth from us, utter destruction. But they are in peace. For if before men, indeed, they be punished, yet is their hope full of immortality; Chastised a little, they shall be greatly blessed, because God tried them and found them worthy of himself. As gold in the furnace, he proved them, and as sacrificial offerings he took them to himself. Those who trust in him shall understand truth, and the faithful shall abide with him in love: Because grace and mercy are with his holy ones, and his care is with his elect. The just man, though he die early, shall be at rest. For the age that is honorable comes not with the passing of time, nor can it be measured in terms of years. Rather, understanding is the hoary crown for men, and an unsullied life, the attainment of old age. He who pleased God was loved; he who lived among sinners was transported — Snatched away, lest wickedness pervert his mind or deceit beguile his soul; For the witchery of paltry things obscures what is right and the whirl of desire transforms the innocent mind. Having become perfect in a short while, he reached the fullness of a long career; for his soul was pleasing to the Lord, therefore he sped him out of the midst of wickedness. But the people saw and did not understand, nor did they take this into account. My soul is deprived of peace, I have forgotten what happiness is; I tell myself my future is lost, all that I hoped for from the Lord. The thought of my homeless poverty is wormwood and gall; Remembering it over and over leaves my soul downcast within me. But I will call this mind, as my reason to have hope: The favors of the Lord are not exhausted, his mercies are not spent; They are renewed each morning, so great is his faithfulness. My portion is the Lord, says my soul; therefore will I hope in him. Good is the Lord to one who waits for him, to the soul that seeks him; It is good to hope in silence for the saving help of the Lord. Brothers and sisters: Hope does not disappoint, because the love of God has been poured out into our hearts through the Holy Spirit who has been given to us. For Christ, while we were still helpless, died at the appointed time for the ungodly. Indeed, only with difficulty does one die for a just person, though perhaps for a good person one might even find courage to die. But God proves his love for us in that while we were still sinners Christ died for us. How much more then, since we are now justified by his Blood, will we be saved through him from the wrath. Indeed, if, while we were enemies, we were reconciled to God through the death of his Son, how much more, once reconciled, will we be saved by his life. Not only that, but we also boast of God through our Lord Jesus Christ, through whom we have now received reconciliation. Brothers and sisters: Are you unaware that we who were baptized into Christ Jesus were baptized into his death? We were indeed buried with him through baptism into death, so that, just as Christ was raised from the dead by the glory of the Father, we too might live in newness of life. If, then, we have died with Christ, we believe that we shall also live with him. We know that Christ, raised from the dead, dies no more; death no longer has power over him. Brothers and sisters: Those who are led by the Spirit of God are sons of God. For you did not receive a spirit of slavery to fall back into fear, but you received a spirit of adoption, through which we cry, Abba, “Father!” The Spirit itself bears witness with our spirit that we are children of God, and if children, then heirs, heirs of God and joint heirs with Christ, if only we suffer with him so that we may also be glorified with him. I consider that the sufferings of this present time are as nothing compared with the glory to be revealed for us. For creation awaits with eager expectation the revelation of the children of God; for creation was made subject to futility, not of its own accord but because of the one who subjected it, in hope that creation itself would be set free from slavery to corruption and share in the glorious freedom of the children of God. We know that all creation is groaning in labor pains even until now; and not only that, but we ourselves, who have the firstfruits of the Spirit, we also groan within ourselves as we wait for adoption, the redemption of our bodies. Brothers and sisters: If God is for us, who can be against us? He did not spare his own Son but handed him over for us all, will he not also give us everything else along with him? Who will bring a charge against God’s chosen ones? It is God who acquits us. Who will condemn? It is Christ Jesus who died, rather, was raised, who also is at the right hand of God, who indeed intercedes for us. What will separate us from the love of Christ? Will anguish, or distress or persecution, or famine, or nakedness, or peril, or the Word? No, in all these things, we conquer overwhelmingly through him who loved us. For I am convinced that neither death, nor life, nor angels, nor principalities, nor present things, nor future things, nor powers, nor height, nor depth, nor any other creature will be able to separate us from the love of God in Christ Jesus our Lord. Brothers and sisters: No one lives for oneself, and no one dies for oneself. For if we live, we live for the Lord, and if we die, we die for the Lord; so then, whether we live or die, we are the Lord’s. For this is why Christ died and came to life, that he might be Lord of both the dead and the living. Why then do you judge your brother? Or you, why do you look down on your brother? For we shall all stand before the judgment seat of God; for it is written: As I live, says the Lord, every knee shall bend before me, and every tongue shall give praise to God. So then each of us shall give an accounting of himself to God. Brothers and sisters: Christ has been raised from the dead, the first-fruits of those who have fallen asleep. For since death came through a man, the resurrection of the dead came also through man. For just as in Adam all die, so too in Christ shall all be brought to life, but each one in proper order: Christ the first-fruits; then, at his coming, those who belong to Christ. Brothers and sisters: Behold, I tell you a mystery. We shall not all fall asleep, but we will all be changed, in an instant, in the blink of an eye, at the last trumpet. For the trumpet will sound, the dead will be raised incorruptible, and we shall be changed. For that which is corrupt ible must clothe itself with incorruptibility, and that which is mortal must clothe itself with immortality. And when this which is corruptible clothes itself with incorruptibility and this which is mortal clothes itself with immortality, then the Word that is written shall come about: Death is swallowed up in victory. Where, O death, is your victory? Where, O death, is your sting? The sting of death is sin, and the power of sin is the law. But thanks be to God who gives us the victory through our Lord Jesus Christ. Brothers and sisters: We know that the One who raised the Lord Jesus will raise us also with Jesus and place us with you in his presence. Everything indeed is for you, so that the grace bestowed in abundance on more and more people may cause the thanksgiving to overflow for the glory of God. Therefore, we are not discouraged; rather, although our outer self is wasting away, our inner self is being renewed day by day. For this momentary light affliction is producing for us an eternal weight of glory beyond all comparison, as we look not to what is seen but to what is unseen; for what is seen is transitory, but what is unseen is eternal. For we know that if our earthly dwelling, a tent, should be destroyed, we have a building from God, a dwelling not made with hands, eternal in heaven. Brothers and sisters: We know that if our earthly dwelling, a tent, should be destroyed, we have a building from God, a dwelling not made with hands, eternal in heaven. We are always courageous, although we know that while we are at home in the body we are away from the Lord, for we walk by faith, not by sight. Yet we are courageous, and we would rather leave the body and go home to the Lord. Therefore, we aspire to please him,whether we are at home or away. For we must all appear before the judgment seat of Christ, so that each may receive recompense, according to what he did in the body, whether good or evil. In the Catholic funeral rite the focus is on Christ, his death and resurrection, and the promise we have of life after death. While we pray for the deceased, he or she is not the principal focus of the rite. Consequently, any remembrance of the deceased during mass needs to be kept in perspective. This note is intended to give some guidance to those offering reflections on the deceased during the funeral mass itself. There are, of course, other opportunities to offer reflections. One time that offers greater flexibility is at a collation or meal following the burial. At that time several persons can share reflections in this informal setting. One could also speak at the wake or at the cemetery. If you are speaking in Church, we ask that the following guidelines be observed. ~ Only one person is to speak at the funeral mass itself. As noted above, if more wish to speak they can do so at the funeral home or at the collation. Of course, the speaker is free to make reference to what others said about the deceased in his/her remarks. ~ Remarks in Church are made at the lectern or pulpit after communion. ~ Reflections are to be no longer than 3 to 5 minutes. That is about 2 pages double spaced or 1 page single-spaced. Again, if more needs to be said, you can do this at the funeral home or at the collation. ~ It would be appreciated if you would email or fax a copy of your remarks to the parish as soon as prepared, no later than the night before the funeral ( mary@christthekingparish.com; fax: 508-477 -8158 ). This will help to assure that the celebrant’s homily will not contain the same things you have in your remarks. ~ There is no need to give a full obituary of the deceased. This can be printed in a program if you have one. ~Please remember that your remarks should reflect the fact that they are being delivered in a church. Thanks for honoring these guidelines. click Funeral Mass Guidelines to print the information on this page.